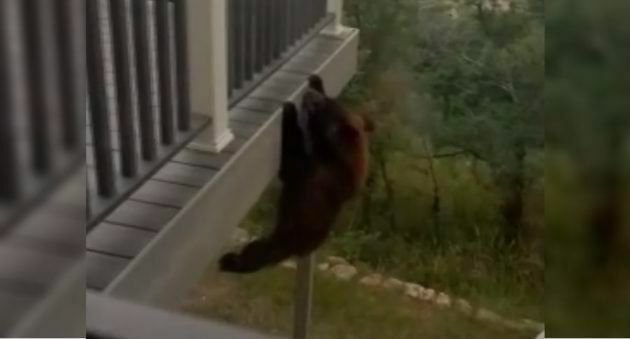 Most humans would probably panic if they found themselves hanging off a second-floor deck, but not this Colorado bear. The distressed critter kept his (or her) cool while hanging onto a second-floor deck for dear life. The tense video is less than a minute long and doesn’t show how the bear ended up in such a hair-raising predicament. Nevertheless, what it does capture is a nail-biting escape from a long fall. Don’t try this at home, cubs. Even after glancing down a couple of times the bear kept its focus. It pulled itself up and grabbed a rail with its mighty jaws. An average bear can weigh from 200 to 900 pounds. At best guess, the one in this video appeared to weigh a good 200-300 pounds. Now, imagine having to hold up that much weight with only your jaws. It’s crazy, and a clear testament to this bear’s spirit. Back to the video. With its jaws clamped to part of the deck, the bear steadily pulls itself up. It grabs on to the rails and climbs up until it’s standing on its hind legs. With something solid finally beneath its paws, the bear appears to take a much-deserved moment to breathe before climbing over the deck and out of view of the camera. 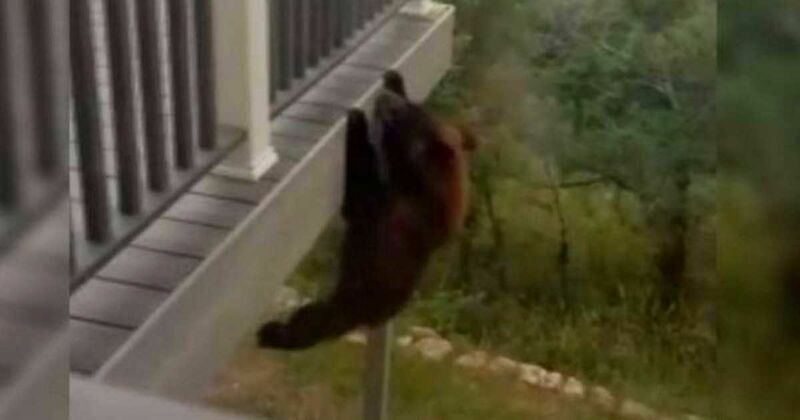 The homeowner who recorded the footage told ABC7News that it’s common to see bears in the area, but witnessing one climb a deck was a first. See for yourself in the video below, and SHARE if you’re a fan of this willful bear.